All the flexibility of SwingArm, for dual monitor applications. SwingArm articulates to virtually any position. The right monitor supports can help you swing into action. 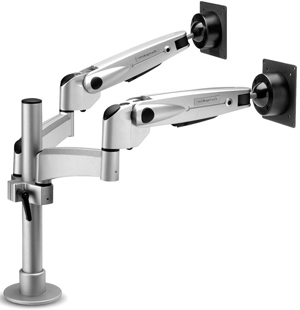 Optimizing the viewing angle, focal length and monitor height with a few simple twists and turns, WorkRite's SwingArm articulates to virtually any position. Double Your Productivity in Comfort - The unmatched flexibility of SwingArm is now available in a dual monitor configuration. Excellent Range of Motion - Vertical height range of 28.25". Reach of 23.25" Five axes of rotation provide tilt range of 145 degree (+/- 72.5 degree). 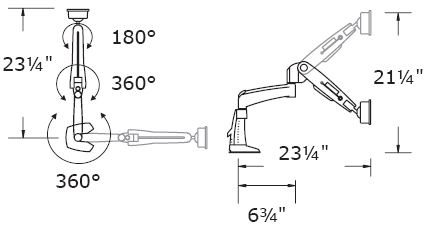 Dual extension arms each rotate 360 degree for maximum reach. Quickly adjusts from Portrait to Landscape orientation. 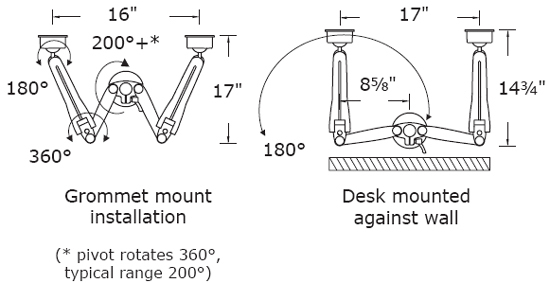 Accommodating - Provides easy adjustment regardless of monitor weight and position. Collapsed depth of 4" increases usable worksurface to reduce overall space requirement. For customized control, including touch screen use, tension is adjustable at all pivot points. VESA compliant - supports both 75 and 100 mm mounting brackets. Supports monitors up to 25 lbs. Goes Anywhere - Position anywhere with your choice of desk mounted with C-clamp or grommet mount. Quality You Can Trust - High quality pneumatic strut cylinder backed by a 10 year warranty. For security, monitors are attached with 4 screws. With a 360degree rotation, monitor can be changed quickly from landscape to portrait orientation. For customized control, including touch screen use, tension is adjustable at all pivot points. All SwingArm products support monitors up to 25 lbs. For security, monitors attach with 4 screws.